In a pot, bring to a gentle boil water with salt and 2 to 3 drops of oil.Add the soaked and drained rice to the hot water.Once it is cooked, keep aside till the rice cools completely. 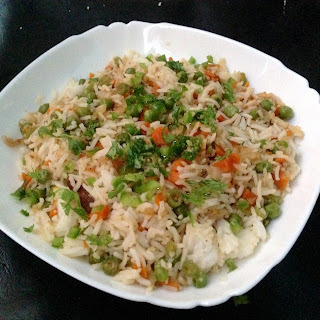 When the rice is cooling, chop the veggies finely and keep aside. remember to chop the french beans very finely. they take more time to cook than other veggies. Heat oil in a pan. first add the onion and fry for some seconds or till it becomes transparent.Add the garlic and saute for some seconds. no need to brown the garlic. Then add all the finely chopped veggies. Increase the flame on a high and stir fry the veggies on a high flame. Then add the rice. stir fry for a few minutes till the sauce has coated the fried rice well. keep a check when adding salt, as soy sauce already has salt in it. Finally garnish with coriander leaves.Serve the veg fried rice immediately.